00:15:00 Makes 4 servings, 1 sandwich (235 g) each. Makes 4 servings, 1 sandwich (235 g) each. 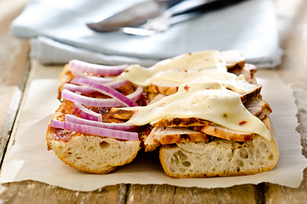 Chicken breasts, BBQ sauce, MIRACLE WHIP and Monterey Jack cheese make these open-face grilled sandwiches a fast and tasty dish! Try doubling the recipe if you need a platter of sandwiches to feed a crowd. Place bread, cut-sides up, on baking sheet. Broil 2 to 3 min. or until cheese is melted. Pour 2 Tbsp. Kraft Original BBQ Sauce over 4 small boneless skinless chicken breasts (1 lb./450 g) in shallow dish; turn chicken over to coat both sides of each breast. Refrigerate 1 hour to marinate. Heat barbecue to medium heat. Remove chicken from marinade; discard marinade. Grill chicken 5 to 7 min. on each side or until done (170ºF), brushing occasionally with additional 2 Tbsp. barbecue sauce the last few minutes. Substitute Kraft Rancher's Choice Dressing for the Miracle Whip. Prepare using a whole wheat baguette. Serving Size Makes 4 servings, 1 sandwich (235 g) each.